#AtoZChallenge – I Am In! 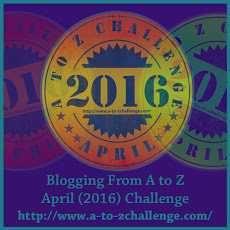 I am taking part this year to participate in the blog fest known as #AtoZChallenge 2016. 26 alphabets, 26 days of fun and 26 posts, #AtoZChallenge is all about. I wanted to do this when I saw few posts last year. I have decided to give it a shot this year. Time is of essence and time and only time will tell whether I would finish the challenge or not but that unknown fear is not going to stop me from participating. I could not make a theme reveal post on March 21st but this is an announcement post to let my readers know that I will be doing the #AtoZChallenge but without any theme. I will write about topics I care about, topics that interest me on that particular day. So, you can expect a variety of posts including few poetic pieces as well. I am looking forward for a bit of fun, frolic and frenzy. Are you in? Hey ! good to see you joining the BlogChatter tribe! Hey Chandni! Pleasure is all mine. We are surely going to have an amazing April! Thank you Amit for the wishes. Thank you Archana! Are you doing the challenge?